In addition to Dolce’s selection as Classical MPR Artists in Residence in 2013-14 – presenting concerts in Twin Cities elementary schools – the ensemble performed on the MPR stage at the 2013 Minnesota State Fair, was the house band for MPR’s 2010 Taste of the Holidays Concert at the Fitzgerald Theater in 2010, and was featured on the station’s Holiday Sampler broadcast in 2009. In 2007 Dolce performed live on-air during MPR Day in Rochester and for MPR’s Music Alive event at Calhoun Square in Minneapolis. Among the artists series for which Dolce performs are The Schubert Club Courtroom Concert series and Fridays in the Valley concerts in the Twin Cities, Munsinger/Clemens Gardens summer series in St. Cloud, the international Vintage Band Festival in Northfield, and Summer Mostly Thursdays series in Bayfield, Wisconsin. For Chamber Music Minnesota, Dolce videotaped a live performance and interviews used in music education programs nationwide since 2002. 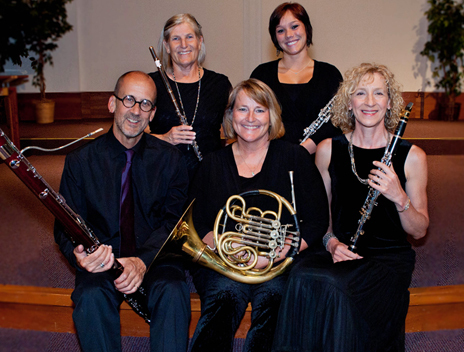 Dolce Wind Quintet is a professional ensemble with abundant talent and experience entertaining and educating audiences of all ages. Since 1995 Dolce Wind Quintet has been performing for recitals, weddings, receptions, worship services, schools, charity benefits, and other events, including pub nights! Dolce customizes each performance playlist to delight audiences, drawing from an enormous repertoire of classic and contemporary woodwind quintet literature, transcriptions, popular songs and dances, ethnic music, show tunes, holiday favorites, and more. To engage their listeners, Dolce musicians deliver program notes from the stage, talking about composers’ backgrounds, the cultural context of the pieces, and musical elements for which the audience can listen. The musicians are flutist Nancy Wucherpfennig, oboist Megan Dvorak, clarinetist Karen Hansen, bassoonist Ford Campbell, and hornist Vicki Wheeler. All teach and perform in the Twin Cities area and hold positions with other chamber ensembles and several orchestras – from Bloomington and Rochester to Mankato and Duluth.